This past weekend we finished a brief sermon series on neighboring. Neighboring, a seemingly simple thing is actually at the very heart of God. "What must I do to inherit eternal life," the lawyer asks Jesus. The answer? Love God and love your neighbor. Neighboring seems like a simple thing, but our lives and even the layouts of our very homes make neighboring difficult. A good neighbor is hard to find. If you are one, that stands out. 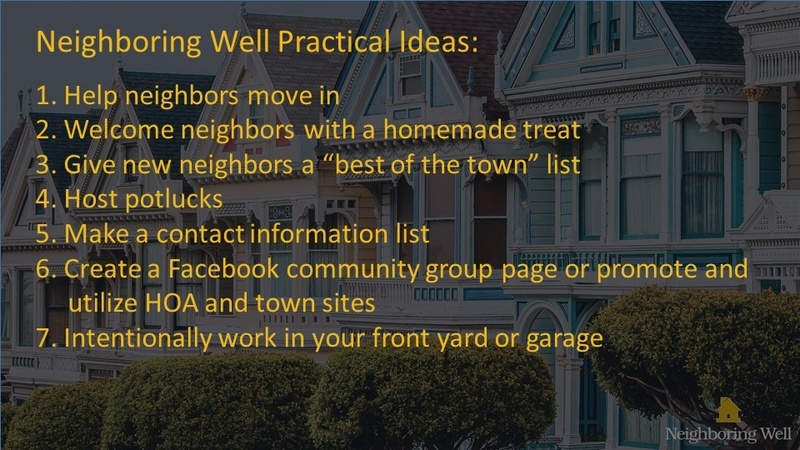 What would it look like if we were known for neighboring well? How would that impact our neighborhoods? How might it prepare the hearts of those we live near for the gospel? Here are a couple of resources (the first is a list generated by the New Life staff, the second is borrowed from Ed Stetzer) to help encourage us to take simple steps toward neighboring with God's heart.